Hello, beautiful people. Do you know what you did today? Do you have any idea what you did today? We start tomorrow–the third day of our clean up–with all of our flooded homes empty of almost EVERYTHING the flood waters touched. Stripped to concrete. Do you know how incredible this is? You are amazing. 41 units, emptied of their contents, stripped of drywall, carpet, subfloors. You showed up in Sunnyhill before a single home owner, and dropped off a shop vac, tools, supplies. Thank you, Swan family. You came with three trucks and a crew of nine, and started ripping out unit after unit… and carting the debris away with you. And answering our stupid, frightened questions. And carrying generators for us. And laughing, and making us laugh. Thank you, Ironwood Building Systems. You grabbed a clean wheel barrow, loaded it up with food, and pushed it around the co-op, giving people water, apples, coffee, donuts, chocolate. Thank you Lisa and Alina. You came in rubber boots and work gloves and said, “Put me to work.” And ripped out drywall for the first time in your life. Then piled debris into a wheelbarrow and pushed it across rocks and a swamp. Thank you–Paola, William … and so many more. Shanti, you were a machine. Darren, I think you might be a robot. You came in such number, we ran out of tools. And masks. But then, you came with masks and expertise, and you listened, and answered questions, and reassured. Thank you, Jim. You came before work. After work. Instead of work. Thank you Andrew, Farro. Dad–daddy, you were incredible. I love you. You came with generators, tools, and knowledge most of us did not have, and you shared it freely. Thank you, Kelly, Geoff, Steve. You came with trucks and muscle and hauled away mountains of debris. So we could make more mountains of debris. And then you came back. Thank you, Adam, Mike, David… and… friends of friends of friends of friends. And generous strangers. You came with friends, spouses, workmates, ready to get exhausted and filthy. And you did so much for us. Thank you Jane, Cheryl, Tracy, Jen (it was so nice to meet after all these years! ), Amy, Karen, Tammy. You came with babies tied to your backs, and organized food and supplies and so much more. And you brought your significant others to lift heavy stuff. And then you took perishables home, so we wouldn’t have to worry about them. Thank you, Natalie. You came to watch kids… and ended up hauling out loads of garbage. Thank you, Bella. You walked blocks and blocks–because you couldn’t drive in any closer–to pick up soggy laundry. And you pushed it across half of Sunnyside in a recycling bin, because we were out of wheelbarrows. Thank you, Brandie. You showed up as the rain was starting to drizzle and started to shovel mud off the front entryways and driveways. Thank you, beautiful strangers. There were so many of you there today whose names we didn’t ask — forgot, as we scrambled to find you tools, rushed you into a unit, abandoned you next to a disaster that needed taking care of. And yeah, we’re not done. We’ve still got so much to do. But wow. YOU ARE AMAZING. I wish I could name each of you, embrace each of you, tell you adequately how much what you did today means to all of us. Thank you. It doesn’t seem enough. Thank you. See you tomorrow. And yeah, I’ll tell you exactly what we need for tomorrow. Just give me a moment. I want to show you some pictures first. 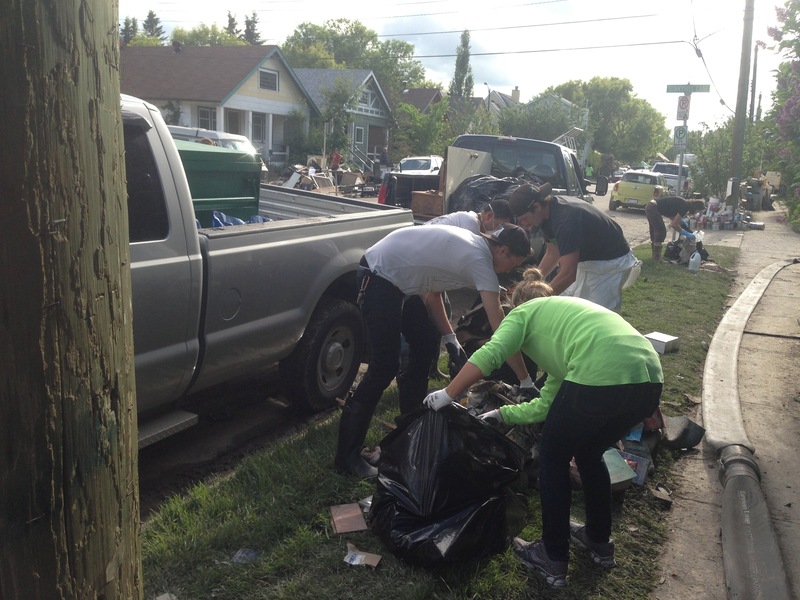 I purposefully chose this very unglamorous photo of volunteers gathering garbage into bags, because–well, clean up, salvage, rip out, what we’re doing–not glamorous, is it? Ugly, dirty work. I’ve never seen people look so happy while gathering garbage. Or feel so good afterwards. If you’re a Calgarian, you know this. That’s why Sunnyhill gutted 38 units in a day. For more photos from our third day of clean up, pop over to my Facebook album, Cleaning up Sunnyhill, Day 3. Coming on Wednesday? Here’s what we need for Wednesday, June 26. Siksika, Morley and Eden Valley are in need of help and donations…so if you all could pass the message on to other people outside the co-op who may be in a position to donate goods, canned food, gift cards, time driving/delivering I would be grateful. Many homes are gone, very few resources. For donations either call Yvonne at 403 836 3166 or drop them off at Tsuu T’ina Buffalo Run golf club (behind the gas bar) or at the Tsuu Tina Sportsplex. We don’t need more clothes, we have a great inventory that will see us through a couple of weeks at the least.